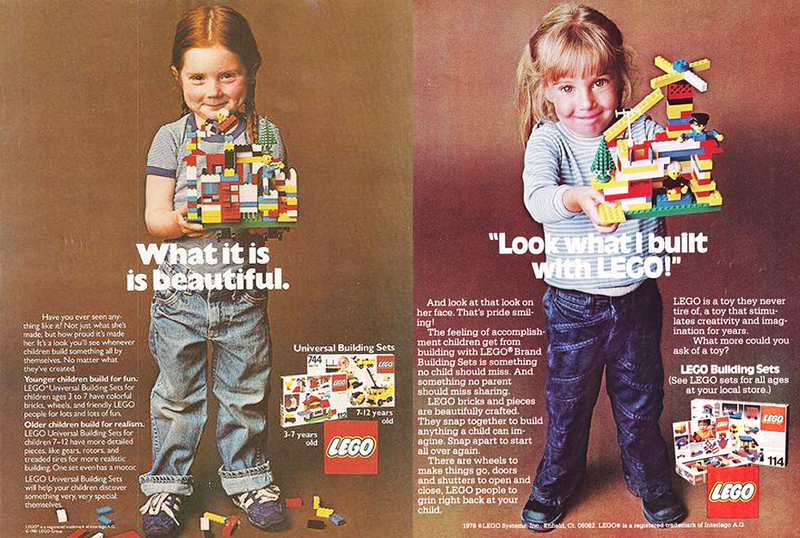 Much has been made over the years of a 1981 LEGO ad, and others like it, featuring a beaming young red-headed girl holding up her LEGO creation over the caption “What it is is beautiful.” Many people remember the ad campaign as revolutionary for its gender inclusivity, as though LEGO had excluded girls in its previous marketing materials. 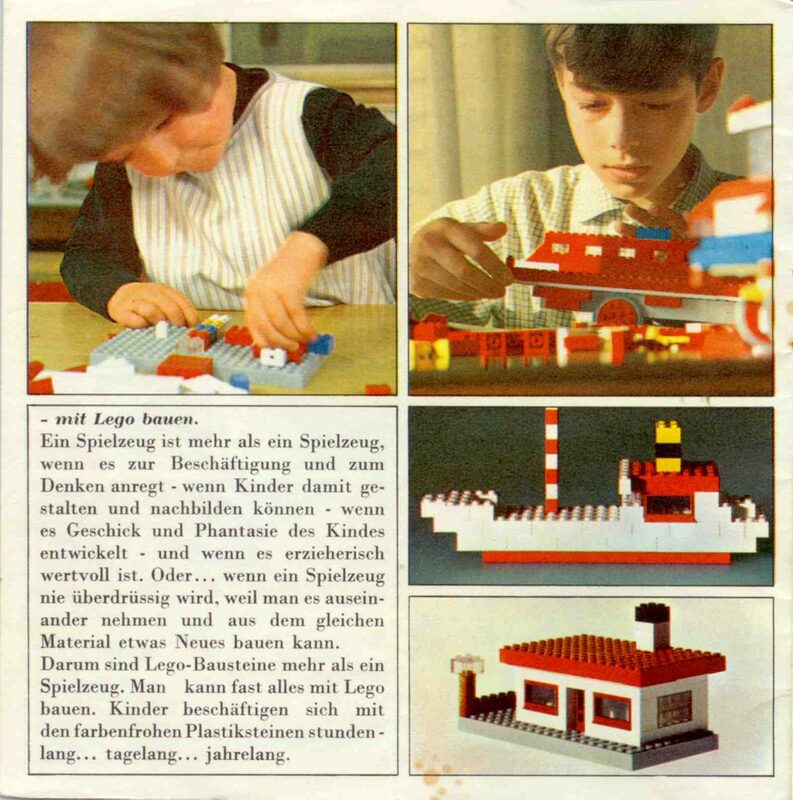 The gendering of LEGO products happened slowly over time, but the company’s first few decades were totally unlike what we see today. 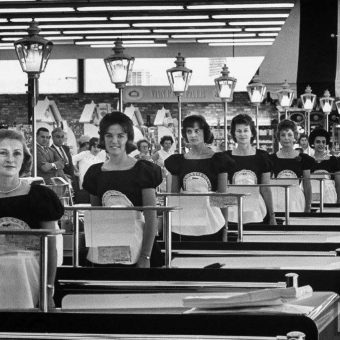 Rather than breaking new ground, the 1981 ads were a restatement of the company’s decades-long universal aims and inclusivity. 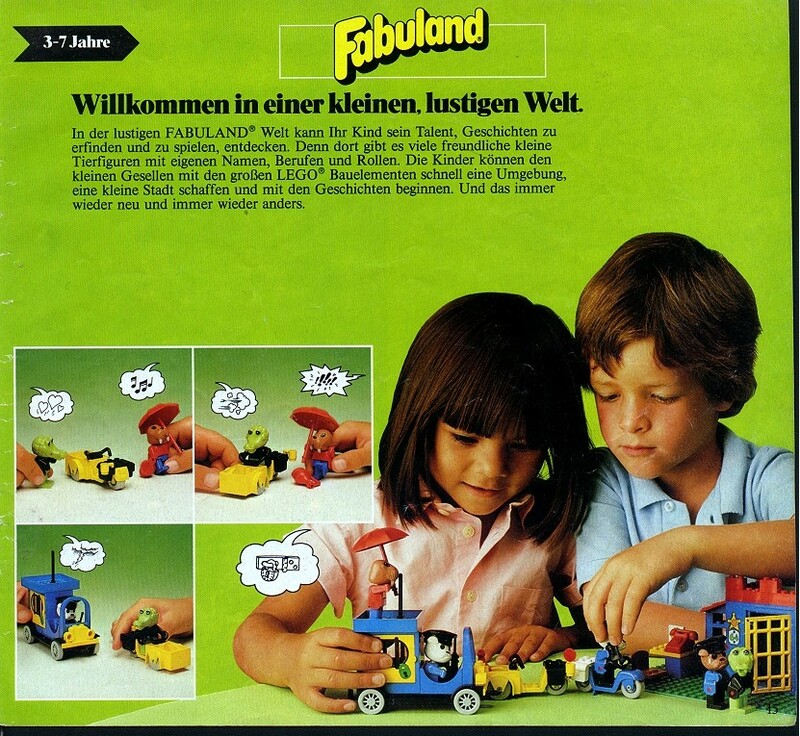 As any parent who has visited the bewilderingly-themed, branded, and starkly gendered LEGO toy aisle(s) of late might tell you, the gender politics of LEGO have become pretty regressive since these ads appeared. 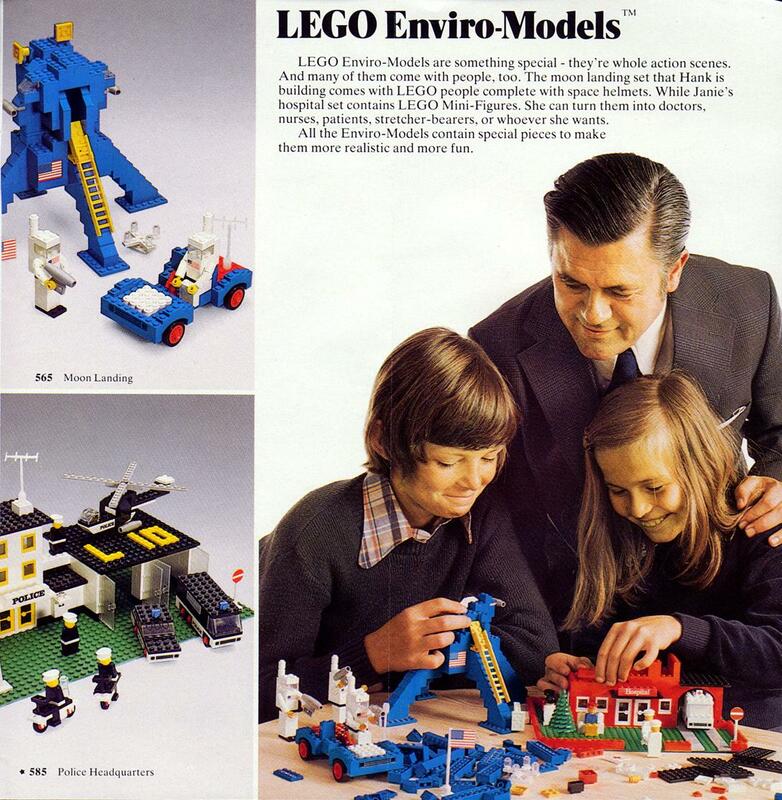 The ad campaign above represents what for many people was a heyday for the brand, when it had standardized its “people” in the “minifig” design, diversified into more extensive outer space, medieval, and other playsets, but hadn’t yet become so hyperspecialized that it excluded more imaginative free play or divided neatly into separate, color-coded boy and girl aisles. 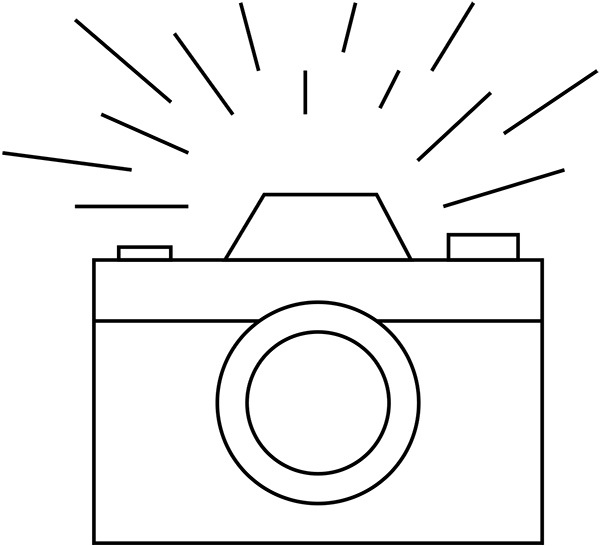 A few years ago, the woman who starred in that celebrated “beautiful” ad as a child, Rachel Giordano, recently looked back on the period fondly and expressed disappointment in where the toys have gone. Social media marketer and LEGO animator (and self-described fanatic) David Pickett agrees, and has written an extensive four-part series on the evolution of LEGO from its 1932-1977 “Brick Era” to the “Lean Fighting Machines” and pink and purple Barbie- and Bratz-like sets of the present day. 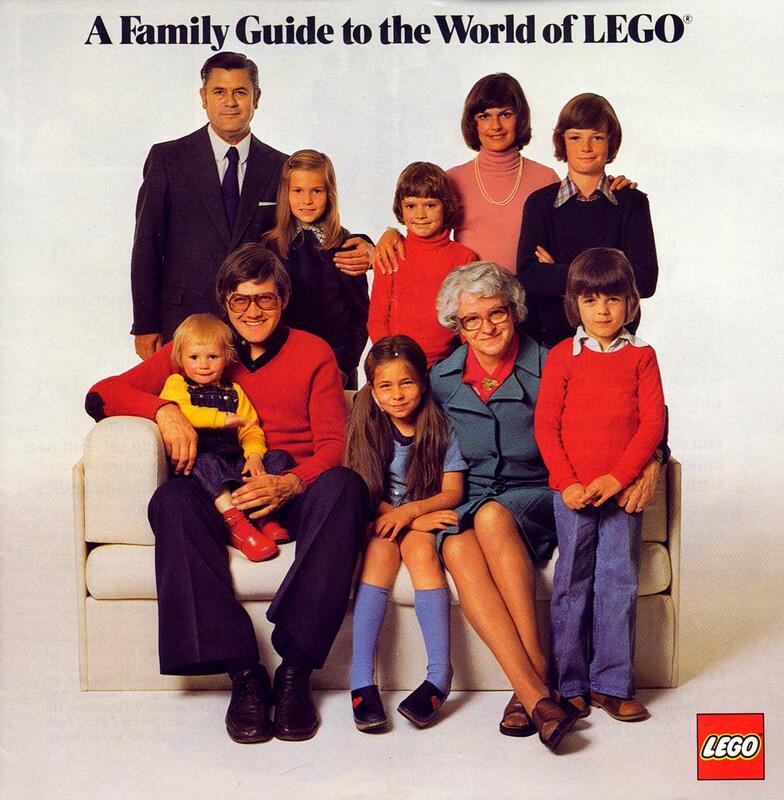 For its first two decades, “the company produced primarily wooden toys” until “the iconic LEGO brick was patented as we know today in 1958.” In the 60s, key parts like wheels, windows, and hinges came into production. 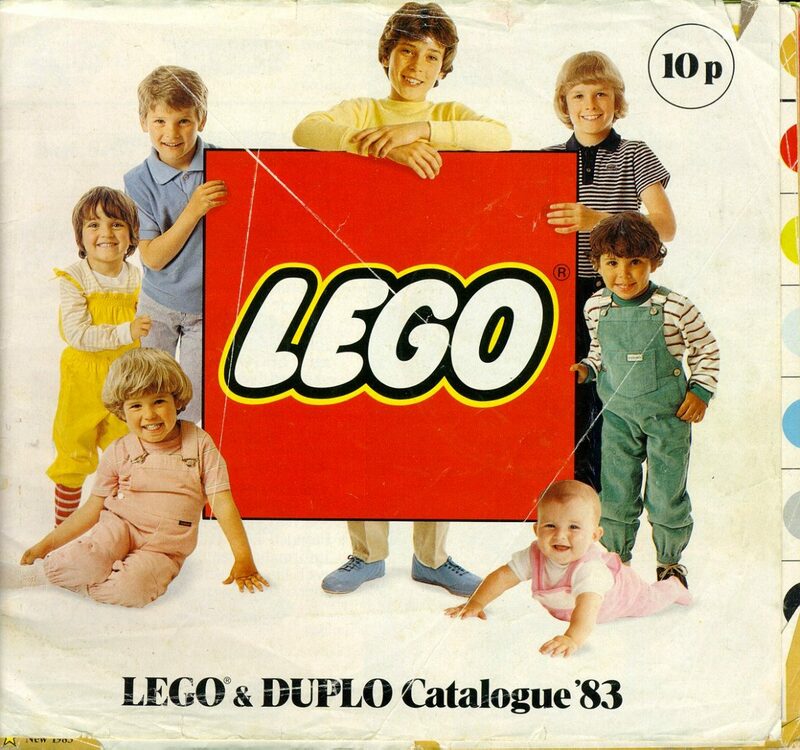 The DUPLO preschool range launched in 1969. 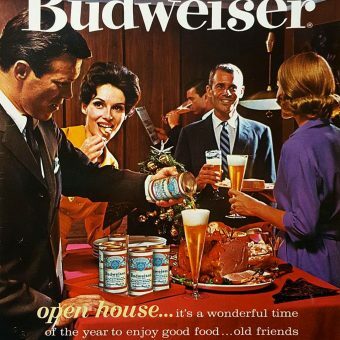 “Marketing images from this era,” notes Pickett, “tend to feature boys and girls equally.” Catalogs from the 50s to the 80s show “universal building sets” with simple, cooperative play for boys, girls, and even, in one campaign, a whole, multigenerational family. 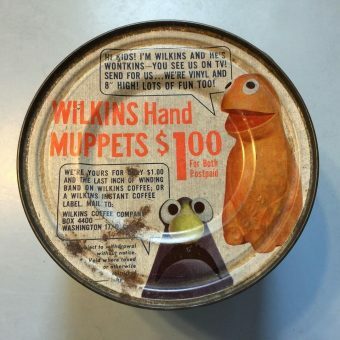 Specifically gendered products were, it’s true, introduced in the 70s. 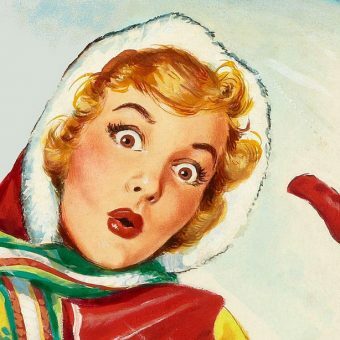 For example, a “Homemaker” line was clearly marketed to girls. But, Pickett writes, these sets “are not very different from the rest of the products offered at that time” in their color schemes and ability to incorporate their pieces into other brick sets. 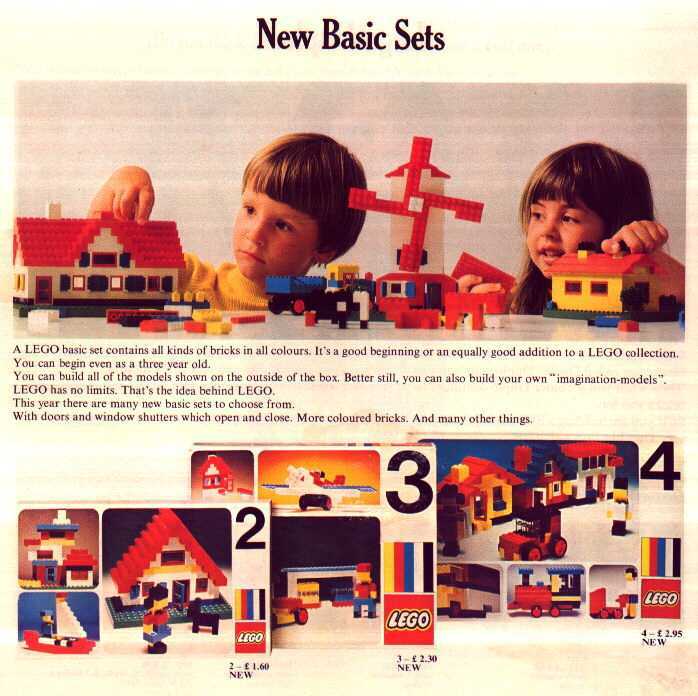 Marketing for other so-called “Basic Sets” continued to show boys and girls playing together. 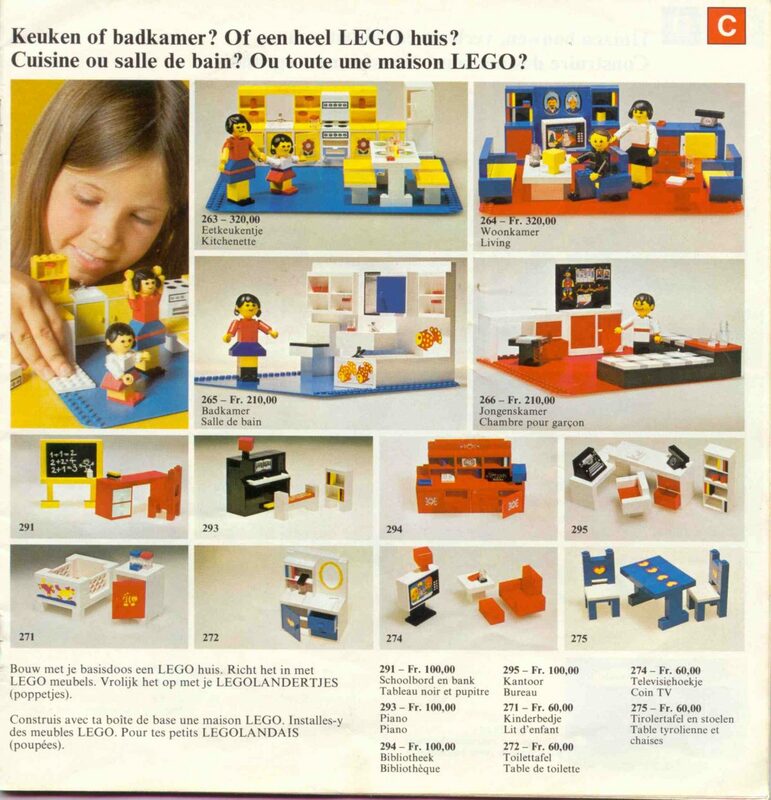 The images here come from a huge archive of LEGO catalogs from around the world, from the mid-50s to the 2000s. 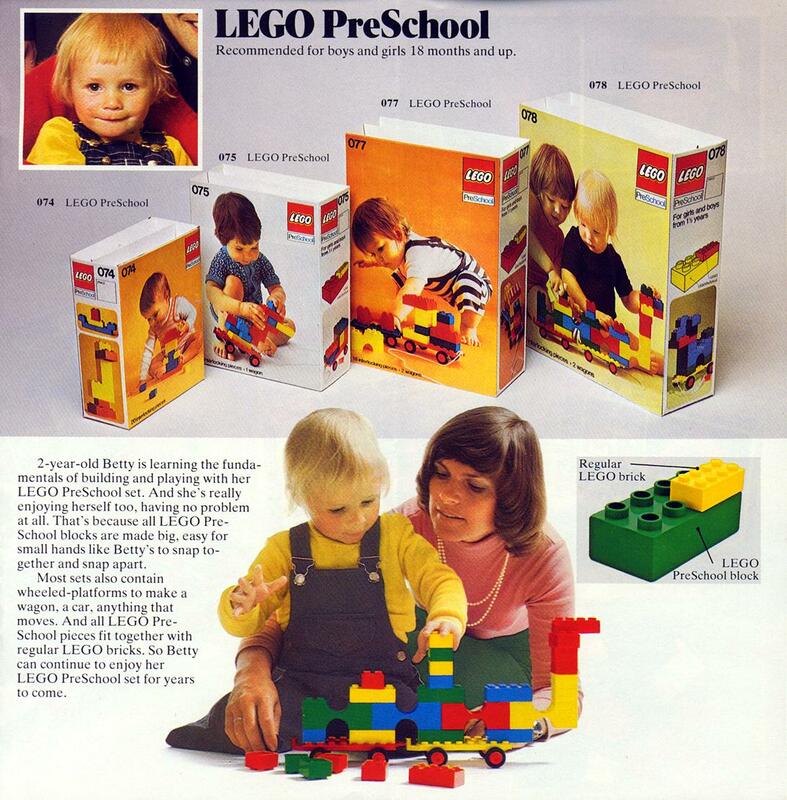 Flipping through them, we see the development of the brand from simple blocks, to the 1978 introduction of “minifies” and more detailed playsets, to complex, self-contained, cross-branded designs marketed specifically to boys or girls and “delivering a message,” as Giordano puts it, about what those identities mean.